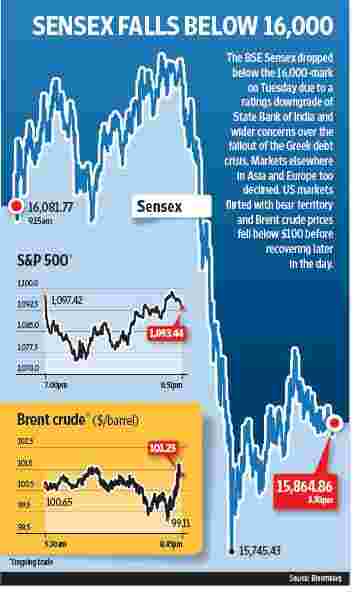 New Delhi: Markets dropped for a third straight session on Tuesday, falling 1.77% to their lowest close in more than five weeks, as a rating downgrade of top lender State Bank of India (SBI) rattled investors and sent bank stocks reeling on renewed fears of weakening asset quality. “The market sank after SBI got downgraded. One downgrade of SBI can drag this market 250 points, even 400 points at one time, that shows the market is vulnerable, the market is weak," said Arun Kejriwal, strategist at research firm KRIS. The sector index fell 3.1%, with top private lender ICICI Bank shedding 4.6% and smaller rival HDFC Bank dropping 1.6%. “Call it knee-jerk reaction, call it panic, call it whatever you want... in the short-to medium term, we should be ready for some not very pleasant surprises," Kejriwal said. The main 30-share BSE index closed down 286.59 points at 15,864.86, with all but 7 of its components in the red. The index touched 15,745.43 points during the day, its lowest level since 8 February. The 50-share NSE index closed down 1.6% at 4,772.15 points. “The market is absolutely oversold. Even the smallest of positive triggers can take the market up," said Kishore Ostwal, chairman and managing director, CNI Research. State-run Oil & Natural Gas Corp fell 1.5% to ₹ 264.05. Earlier, its newly appointed chairman Sudhir Vasudeva said the government must take a call on when it wants to go ahead with a share sale in ONGC, a divestment programme expected to raise as much as $2.5 billion. ONGC’s share sale, first scheduled for March, has been postponed several times this year due to the turmoil in global markets and lingering concerns over the federal government’s fuel subsidies, part of which are borne by the explorer. Maruti Suzuki , India’s top car maker, outperformed the broader market, rising 2.8%, as the central bank removed the company from the caution list for foreign institutional investments. In the broader market, there were 2.2 losers for every gainer, with around 580 million shares changing hands. World stocks hit a fresh 15-month low on Tuesday and the dollar rose to a nine-month peak as fears over a major banking crisis in Europe mounted along with expectations Greece could soon default, accelerating a global economic slowdown. In Europe, London’s blue chip index shed 2.33% by 1028 GMT, adding to Monday’s 1% fall and echoing sharp falls on Wall Street and in Asia overnight, which fell to 13-month and 16-month lows respectively. The MSCI world equity index was down 1.3%, while Japan’s Nikkei closed 1.05% down. Power Finance Corp fell 4.85% after Macquarie said it expects the company to book a large mark-to-market loss in the second quarter of the current fiscal year due to unhedged foreign currency liabilities and a sharp fall in the rupee. Larsen and Toubro rose 1.48% on fund buying after Nomura said it was the best large-cap play on the India investment theme and that the recent correction presents good opportunity to buy.